With no new team leader, Azarudo and Cubaru both want to play next. But Genis says he’s asked Naria to take care of something first. At the treehouse, Uncle Mario is now a cow and fools around with Leo before heading out. As a cow. The Zyuman4 are amused by Uncle Mario’s dedication for researching animals. Yamato, meanwhile, is downtown handing out flyers for BirdMan. He hears nearby screaming. Naria and her “love slave” Mantoro are going after animal-costumed people with Mantoro using his mantle to teleport them somewhere. 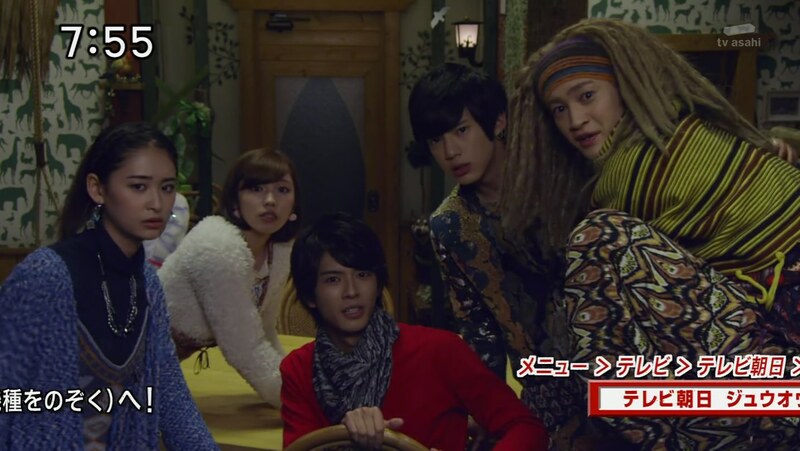 Yamato morphs and the others arrive to help. Naria takes Mantoro and they leave. Ginis laughs happily. 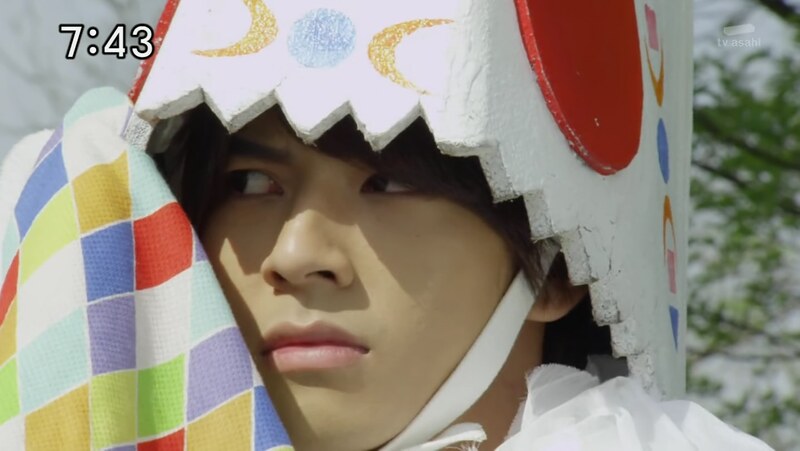 Yamato goes over to the bunny costume guy who was just about to get taken by Mantoro. He says the monster was looking for Zyumans. They split up to try and find where the monster took the kidnapped people. A little girl says she saw a cow being kidnapped and Yamato finds a cow’s tail. They realize it was Uncle Mario. 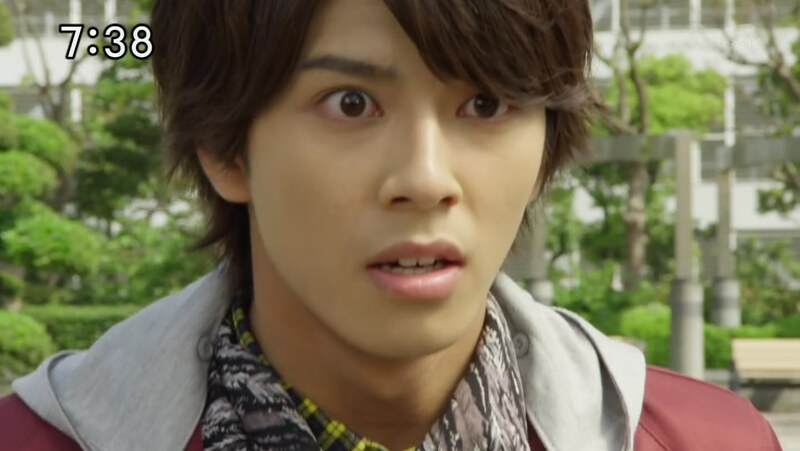 Yamato can’t believe it. He is ready to rush off to find his uncle, but the others tell him to calm down first. Yamato says he can’t. Uncle Mario has been there for him since he was a kid, including one night when Yamato had a fight with his dad. Yamato admires his uncle the most and he’s the only family he has left. The others understand and say they are also grateful to him. Yamato gets an idea. He dresses up in Uncle Mario’s chicken costume so he can get caught. Mantoro appears and takes him. 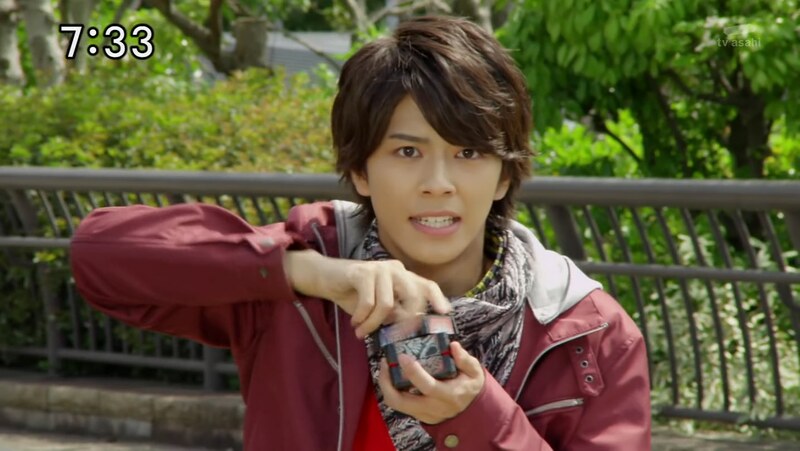 Yamato gets thrown into a cell, but he sends Cube Eagle to alert the others to their location. Naria and Mantoro are filtering through the animal costumes to find people who are “compatible.” Of course, none of them are. Yamato watches as Naria tells the people they will be erased since they have no purpose in the game. Everyone except Uncle Mario is scared sh-tless. He stands up to Naria, appalled that they are bringing The Most Dangerous Game to life. Naria grabs Uncle Mario by the neck to punish him for his defiance of Genis-sama. Uncle Mario rejects the idea of higher and lower life forms. Just before Naria can choke Uncle Mario to death, Yamato decides to act. He morphs and kills all the Moebas. He makes sure the captives can get to safety before turning his attention to Mantoro and Naria. Naria shoots at Uncle Mario as he runs out, but Yamato protects him. The others arrive and the team takes on Mantoro. Mantoro is able to use his quick teleportation power to his advantage. But Yamato sees right through Mantoro’s strategy and manages to destroy his mantle. 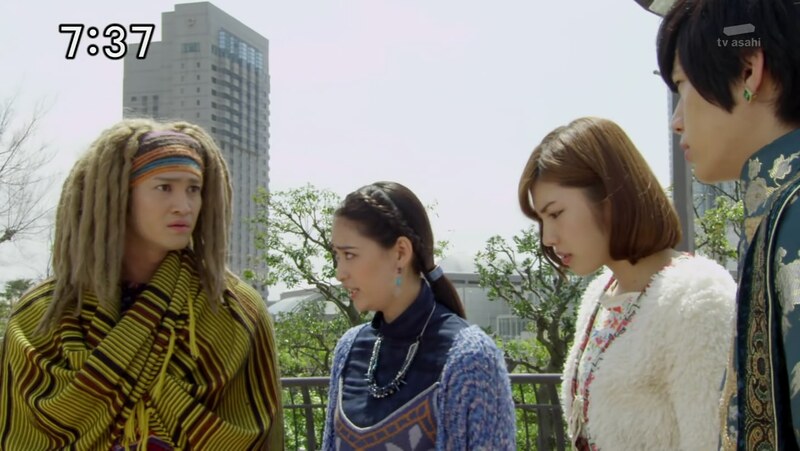 The Zyuohgers take care of his first life with a ZyuohSlash and Naria quickly inserts a Continue. The Zyuohgers hop into ZyuohKing and ZyuohWild and must now face Mantoro’s swordplay. Yamato uses his super sight to again see through Mantoro’s attack. The Zyuohgers go Wild ZyuohKing with the entire crew and finish off Mantoro for good. Back at the treehouse, Uncle Mario tells everyone about how amazing ZyuohEagle was today. Up on the ship, Naria presents some “compatibles” who are chained up. Zyumans and a shirtless man. Genis is excited to play with them. Much better episode than the last one. I definitely enjoyed seeing more of Yamato and Uncle Mario’s relationship and thus seeing more of Yamato’s backstory. It seems very interesting to me. Getting to see Genis and crew do something other than play Most Dangerous Game is also good. That last scene was legit surprising to me, so I am very excited, even though I know what’s coming up with that.